Lots of people like Ron Paul. But not generally people like me. Not many Europeans have even heard of him. The maverick Republican senator only gets microscopic coverage in the news media over here, even now when he is one of the hopefuls trying to pick up the nomination for president. I am pretty much on the left politically, so I don’t generally warm towards Republicans. I’m not keen on their politics to begin with. And on top of all that, as an atheist I find bringing religion into politics annoying, so the primaries when the candidates are trying to appeal to the committed are something I usually prefer to ignore. So what gets me into the Ron Paul fan club? I’ve forgotten how I first came across him, but somehow I ended up watching a video on Youtube where he was talking about legalising drugs, not a position I’d have expected from the right of the Republicans. I did a bit of googling and found an article with more detail. It was thought provoking stuff. I have never taken drugs nor ever been greatly tempted to, and I am pretty supportive of legislation to stop other people from taking them. I personally think that one of the good things about living in an ordered society is that we can have rules that stop people doing stupid things to themselves that they are quite likely to regret later. Drug abuse is a classic case, damaging the health of the taker themselves and also affecting the people around them. So when governments deploy police and troops to cut off the supply of drugs I am one of the people cheering. 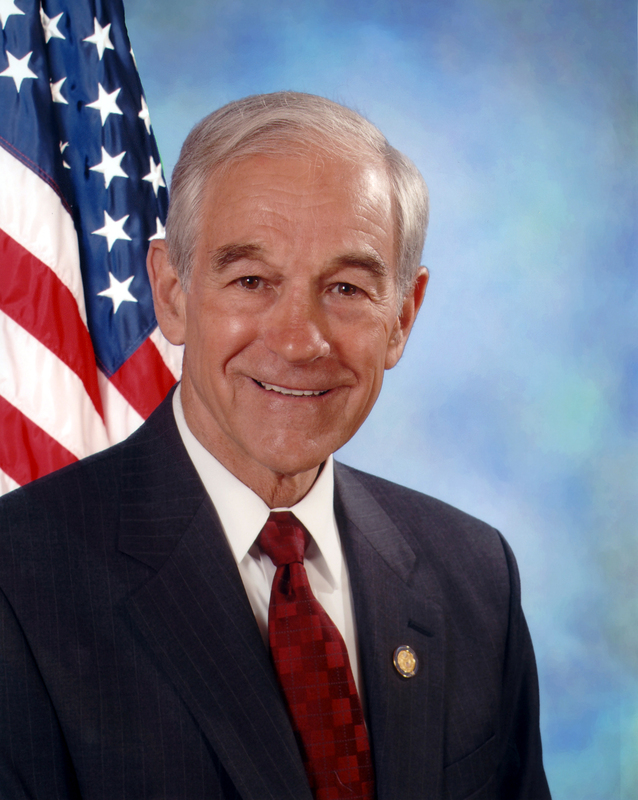 But Ron Paul came at the subject from an angle that had never crossed my mind before. The war on drugs is effectively an intervention by the government to stop people doing what they choose with their own money. Fair enough in my opinion, limiting individual freedom is sometimes a price worth paying in order to achieve a greater good. But what are the effects of this policy? In particular what are the consequences of the ‘war on drugs’ where effort is concentrated at tackling drug supply at source. Well one undesired consequence is it generates monopoly profits for people daring and ruthless enough to run the gauntlet of the enforcers. This makes some pretty unsavoury characters rich and powerful. So the efforts to stamp out drugs, while they may reduce drug use, also create a huge problem that didn’t exist before. In some countries the drug barons have both wealth and armed supporters and can rival the power of the government. Wouldn’t it be better just to let people who want to take them get on with it? The answer is no of course, but the Ron Paul argument is very persuasive. When I thought about it, it occurred to me that the problem could be solved by making the supply and distribution of drugs legal and only imposing penalties on the end users. I wasn’t keen on that as a solution at first. It was only on reflection that I realised why. People who use drugs are a lot like me. I sort of identify with them. Ideally I wouldn’t be interfering with their freedom to use drugs in the first place, and actually punishing them for using them, particularly in small quantities, seems a bit draconian. By contrast drug barons are a long way away and I don’t have much sympathy for them. They also don’t give me personally any particular trouble. So directing action at the providers rather than the users is the most convenient for me personally. So if I am honest the status quo happens to suit me fine. It would do so even more if I was a recreational drug user. I can afford the elevated prices – I get to enjoy the drugs and the thrill of breaking the law without much fear of getting caught and I’d only suffer a fairly light penalty if I did. None of which alters the reality which is that the war on drugs is a huge waste of resources that doesn’t even achieve much of a reduction in the behaviour it is supposed to suppressing. And for people who have to contend with the operations of drug trafikers it can be a deadly problem literally. Allowing drugs to be sold cheaply would very likely cause considerably less misery than the illicit trade in drugs currently does. It would also make it much easier to prosecute the end users who at the end of the day are the people who actually caused the problem in the first place. So that was quite beneficial. Confronted with a point of view I didn’t agree with, and still don’t agree with, I ended up realising that my own opinion had been not only wrong, but was probably positively harmful. I have had similar experiences with quite a lot of the libertarian views that Ron Paul expresses in various places online. I recommend having a look at some of Youtube videos of him. His views on Israel are particularly interesting and I think illuminating. This is an area where most people focus on issues of morality or justice. What is Israel justified in doing to defend itself? Should there be a two state solution? Etc, etc. All interesting and important stuff of course, but not something that lends itself to easy answers. Some people dispense with the ethical issues and concentrate on the power politics. Is Israel simply a tool of American policy, providing military bases and support in projecting US power? Paul on the other hand seems to regard the whole thing as simply an exercise in pork barrel politics. He doesn’t say this explicitly, but I think he regards the vast sums of money the US gives to Israel as the main issue. Could he be right? Could the high level of funding, a relatively recent development historically, simply represent the strength of the Jewish lobby? Piles of cash for projects of dubious value is the ultimate sign of success for a lobby after all. This would put Israel in exactly the same position as the farming lobby seeking to get agricultural subsidies. It has to be said that Israel did pretty well before it started receiving large levels of cash from the US. Regardless of what you think of Israel based on their track record they ought be able to manage quite well without it. Perhaps Paul is on to something there as well. Does even Israel merit a blank cheque? I think this independence from the vested interests that so many politicians – not just in America -rely on may be the key to Ron Paul’s appeal. He seems to be immune to lobbies. If nothing else, the fact that he almost never votes for increased spending shows that either nobody is paying him, or they are getting a terrible deal on their donations. In any democracy vested interests play as big a role in decision making as they can get away with. But this is the case in spades in the United States where Washington is packed with full time lobbyists promoting their particular agenda. The Jewish lobby is the most effective, but they are simply one member of a huge industry employing tens of thousands of people. It is mainly a reflection of the size of the US, which has a budget large enough to make such activities profitable. The generally commercially minded political culture helps as well. But it makes it very easy for the ordinary voter to feel excluded and alienated from the government, so it isn’t surprising that both the Tea Party movement and the Occupy Wall Street protests arise and both show a deep suspicion of Washington insiders. I wonder if they ever get together to compare notes – they may find they have quite a lot in common. But it also explains why Ron Paul’s campaign seems to have resonated with so many people. He talks the way a conservative would talk if he was simply speaking his mind. I don’t want him to win the presidency of course. I am still a socialist and I don’t want a more libertarian world. I don’t think his ideas are really up to being the basis for a programme of government. Having said that, the decision making of people with more mainstream views isn’t always that great so if he did pull it off, it probably wouldn’t be any more of a disaster than usual. In any case, at time of writing the level of support he is attracting makes the prospect of him reaching the White House slim in the extreme. But I hope he stays in the race and keeps up what he is doing, and I hope the supporters he has stick with him. From what I have gleaned from Youtube and his websites he seems to be an honest, intelligent and sincere man. I recommend finding the video where he is booed at a Republican party meeting for suggesting that Al Qaeda’s objectives should be taken at face value rather than the rather bizarre fiction that they ‘hate liberty’. He must have anticipated that reaction. If you have ideas to get across, then there is every reason to keep going even if, as all the pundits are saying, you are not going to win. You can win people over without winning the vote, and ideas can be tough things with a life of their own if you can get them planted. It is a shame there aren’t more people like him around. I would much rather follow a debate about ideas than try and work out what a sound bite means, and I really want to hear ideas that I disagree with and that challenge my assumptions. Thank you to Ron Paul for providing them. Your caveat is right on the mark. Ron Paul is a deeply nasty man. Ta-Nehisi Coates at The Atlantic has done an excellent deconstruction. I had a positive reaction to him when he first ran for President, long ago. With one exception: he thinks abortion should be illegal, and I couldn't figure out how he squares that with libertarianism. Lately, the answer has come out. He doesn't actually believe people should be free of all government interference, just Federal interference. He thinks states should be allowed to make any laws they like. Chattel slavery, for instance. That's interesting Calvus. Thanks for that. It sounds like he is proposing not much short of dismantling the United States then. If you take away the Fed, reduce the army and devolve most of the power to the states, there wouldn't be a heck of a lot of it left. Not being American I guess I can a bit more philosophical about that than you might.